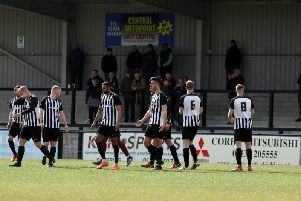 David Bell felt Corby Town took a “step in the right direction” after they opened the new Evo-Stik League South season with five-star display at Steel Park. Sam Mulready scored twice and fellow summer signings Kern Miller and Jack McGovern were also on target while Jordon Crawford added the fifth as the Steelmen thrashed Romulus 5-1. And, after the club suffered back-to-back relegations in the past two seasons, the Corby manager felt the win was a perfect start for his team. “I am delighted, the players were first class with their attitude, application and work-rate,” the Steelmen boss, who was taking charge of his first league game since being appointed during the summer, said. “I thought we were strong in both boxes and we scored some good goals. It was just an all-round good team performance. “We needed to get the shackles off after last season because sometimes you have a carry over period. The game was played out in front of the division’s highest crowd of the day of 402. And Bell hopes there will be much more for the Steelmen faithful to smile about in the weeks and months to come. “It was great to have over 400 in the ground and to be fair they were always with us even when we were in the bottom four last season,” he added. The Steelmen head to Spalding United, who were 2-0 winners at Stocksbridge Park Steels, for their first away game of the season on Tuesday night.